From a closer relationship with customers to reinvigorated employees, things are notably different at Cigna - and its CCO has been a key agent of that change. For quite some time, the insurance industry has been tied to the stigma of all transaction and little customer centricity. David Cordani, Cigna's CEO of two years, believed it was time the health insurer put forth a new global business strategy, connecting itself more closely to its customers and further engaging its 38,000-plus employees across 30 countries. This completely re-energized blueprint is one CCO Maggie FitzPatrick and her communications team thoroughly support. "David has realigned internal resources to make the customer experience much more value-added and wholesome," says FitzPatrick, who has been with Cigna since late 2010. "It's really about expressing that in the marketplace. We wanted to create a category of one. We sought to differentiate ourselves from the competitive field and to acknowledge with consumers that we fully intend to put them front and center." This past fall, FitzPatrick and her team launched "Go You," Cigna's first integrated media and branding campaign targeting the individual consumer. The initiative kicked off the insurer's new business proposition in preparation for 2014, when consumers will have the choice of keeping their current plan or buying coverage through new state-run insurance marketplaces, among other provisions. The communications team led efforts that included extensive social and earned media, as well as ongoing outreach connecting employees to the public. "There's pretty overwhelming research that shows there's no differentiation in the traditional health insurance segment," explains FitzPatrick. "One of the things at the heart of our marketing communications activities is differentiation. It's all about being in the minds of consumers, being a category of one, and breaking out of the pack." "Go You" is also being touted through a major ad campaign. TV spots have been purchased on cable networks including USA, CNN, and A&E. Print ads are ap-pearing in publications such as Time, Marie Claire, Family Circle, and Runner's World, as well as online buys. Fleishman-Hillard, which Cigna named global PR AOR in July, is supporting the ongoing initiative's communications efforts, while Greenville, SC-based Hill Holliday is handling advertising. Along with external efforts, there's also massive outreach going on internally, adds FitzPatrick. "Go You" was initially rolled out to Cigna employees. Internal efforts include a number of programs, such as a colleague storytelling endeavor that gathers elements of success and testimonials, which are then celebrated on a communications platform to exchange best practices. "Cigna had not been expressing a positive or a proactive posture for many years," she says. "The external work we've been doing has had a multiplier effect and benefit internally. It's energized our employees. It's made them excited about the brand. It's created momentum that they are now signing up for things to do to be brand ambassadors." CSR also plays a part in the "Go You" campaign, adds FitzPatrick. A global giving fund was launched. The health insurer is currently assessing different platforms for CSR, asking Cigna employees to inform that process and make sure it's fully aligned with internal and external strategy. In mid-2012, "signature" CSR programs are set to roll out "to enhance and reinforce the overall brand program that's under way," she explains. Behind the strategy overhaul is a fairly new leadership team at Cigna, one that has seen a number of shuffles over the years, particularly within its communications function. Cordani, a 20-year veteran with Cigna, was named CEO in December 2009. He subsequently created its first CCO role following the exit of whistleblower Wendell Potter, former VP of communications who quit and has now become an outspoken critic of health insurance and the industry's efforts to fight healthcare reform. In January 2010, as a CCO search effort was under way, Hill & Knowlton COO Gene Reineke held the role on an interim basis until FitzPatrick took the post in September 2010. FitzPatrick joined Cigna after nearly 17 years at APCO Worldwide, where she most recently served in an EVP role. Today, she sits on Cigna's enterprise leadership team, which also includes the CFO, CIO, and the head of human resources, all of whom report directly to Cordani. FitzPatrick oversees a communications team of approximately 45 people. Her leadership duties include business communications, with a focus on overall strategy and product-specific segments, and corporate communications, such as issues management, public policy, employee communications, and CSR. The team supports IR, which falls under the direction of the CFO. FitzPatrick also serves as president of Cigna Foundation. "It underscores the vital role communicators now play across enterprisewide business strategy," she explains. "It's no longer a functional area that sits alone. It's fully integrated among the business leaders with an equal seat at the table, reporting directly to the CEO." 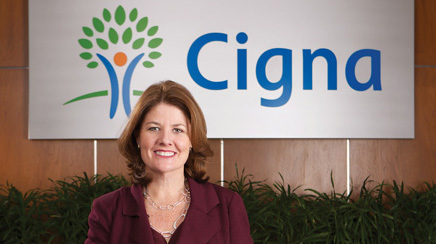 Looking ahead, FitzPatrick says the three key opportunities she sees for Cigna are in growing its social media presence - the health insurer is currently on Facebook, Twitter, and Foursquare - to boost its reputational standing with its customer base; greater global positioning, particularly in recent growth areas in Asia; and increased engagement with its multinational employer clients. P2V, an Arlington, VA-based nonprofit animal assistance program that places shelter animals with service-people who suffer from psychological stress and disabilities, named FitzPatrick to its board in October. She hopes her expertise will help increase the organization's visibility, resources, and ability to secure corporate partnerships. P2V hits two passion points for FitzPatrick, whose brother-in-law is a veteran, and who owns a shelter dog, a mutt named Scout. "It's near and dear to my heart," she says. "It's giving shelter animals and veterans a better shot at life." Cigna Foundation, of which FitzPatrick is president, recently made a $25,000 contribution to P2V, in conjunction with the launch of its Veterans Day 2011 program. P2V is headed by David Sharpe, a US Air Force veteran, who suffers from post-traumatic stress disorder. "We can improve employee productivity and change the way employers engage with their employee bases around health engagement and quality of living, such as stress and weight reduction," she comments. "As costs for companies that pay for healthcare rise, we are offering solutions to bring down the cost and improve employees' health outcomes." When he hired FitzPatrick, Cordani says he took into account the changes he was foreseeing in Cigna's transition from a traditional insurance company to a global health services provider. He also recalls seeing an executive with fresh perspective and diverse experience outside of the insurance lens. Cigna's former communications model, Cordani tells PRWeek, was focused on employers' clients and brokers. Since FitzPatrick came on board, however, the company has personalized the way it communicates with all its stakeholders. "Maggie was also instrumental in our brand rollout to ensure our effort was integrated throughout the company, across functions, audiences, and channels - unifying our message to one clear, succinct voice," he says. "She helped the organization understand the importance of unlocking the DNA and working diligently to assess and meet stakeholder expectations. Maggie is also encouraging us to lean forward and help our colleagues connect with communities in the role of brand ambassadors." Jan Hausrath, EVP and head of APCO Worldwide's reputation management and brand positioning practice, says she first met FitzPatrick upon hiring her in 1997 as a senior associate to help support a coalition for the North Carolina Credit Union League over legislation that would threaten the tax-exempt status of credit unions. Within six months at the agency, FitzPatrick was promoted to VP. Hausrath describes FitzPatrick as a utility player who "does it all," from developing strategy and utilizing her keen political instincts to crisis management, CSR, and M&A. While at APCO, FitzPatrick led the efforts for the United/Continental merger. "I was deeply impressed with her," says Hausrath. "She just shot up the ladder like a rocket because she is so talented. She's extremely creative and has always been able to anticipate trends and get very smart about the direction a trend is going in so she can provide really insightful counsel for clients."